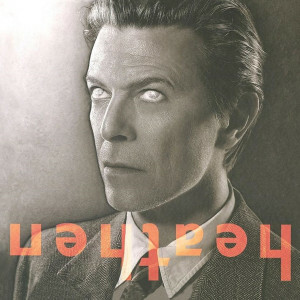 CELEBRATING YOUR HALLOWEEN WITH DAVID BOWIE'S 2002 MASTERWORK HEATHEN!!! ONE OF 4 NEW HIGHLY COLLECTIBLE "HEATHEN" COLOR VARIANTS IN TIME FOR THE HOLIDAYS! David Bowie continues to be truly a gift to rock music fans everywhere. There will never be another David Bowie, an artistic genius who enthralled generations of aspiring musicians and music lovers the world over with the many fine recordings and concert tours he created seamlessly for many years. Contributing over five decades in the music business, the English native initially captivated millions of kids in the 70’s with his Ziggy Stardust persona. He drove the rockers mad with his stellar concerts and dynamic presence on the stage. As David moved on and started venturing into other fields of music, film and art, he soon emerged as one of the early founders of alternative and ambient music with albums like Low and Heroes. At the turn of the millennium, Bowie scored a new legion of fans with more harder edged recordings like his 2002 multi-platinum masterwork Heathen. Heathen kicks things off with the hard rock guitar sounds on Sunday. This radio and fan favorite graced the alternative and college radio stations and helped bolster even further the rest of the Lp with follow up hits like the tour de force Slow Burn featuring the legendary Pete Townsend, and a stellar revisit of Neil Young’s I’ve Been Waiting For You featuring the guitar work of Dave Grohl. All in all, a truly remarkable album which paved the way to a whole new level of fans as David Bowie continues to be a major force in the music of now and forever. Friday Music is no stranger to the music of the David Bowie, as we’ve been releasing his fine recordings on our label for several years, that is why we are so very pleased to announce another installment in The David Bowie/Friday Music 180 Gram Audiophile Vinyl Series with a new color variant of his legendary masterpiece Heathen. Mastered impeccably by Joe Reagoso (David Bowie/Iggy Pop/Alice Cooper) for the first time on super limited edition 180 Gram Platinum & Orange Swirl Audiophile Vinyl, David Bowie’s Heathen will truly become one of the more important and collectible 180 Gram Audiophile Vinyl titles in quite some time. To celebrate David Bowie’s amazing career, we further enhance this limited anniversary edition with a striking tri-fold cover featuring the original artwork elements as well as being pressed by R.T.I on this wonderful color variant.